DICE has properties of both the presently existing cryptocurrencies and traditional money, and also creates a brand new funding route for any business. DICE introduces the “Cluster Model” economy, based on a large number of unconnected peers (called “operators”) all working within a singular global ecosystem. Each of those network peers is in a way a small country of its own, and the DICE miners supporting it, are its virtual citizens. “Investment Mining” is another breakthrough that the cluster model provides. Miners own their new DICE, but the capitalisation of the respective operator increases with the overall mining production. This makes an investor out of every miner, and the choice of who will be the operator they mine for, is a completely personal decision. Thus, every operator is in fact a self-funding social structure built around a cause or business venture. Unlike the blockchain, DICE operates on a different principle, much closer to the way deals in the real-world work - a secure and confidential virtual handshake verified by a witness. The DICE model: - Is fully customisable at every single operator’s level for full transparency or full privacy; - may be used in both online and offline transactions - lacks the need for special software wallets DICE is well suited for a shock-free adoption as the new everyday money - not dissimilar from the money we all use today, but updated for use in the digital age. 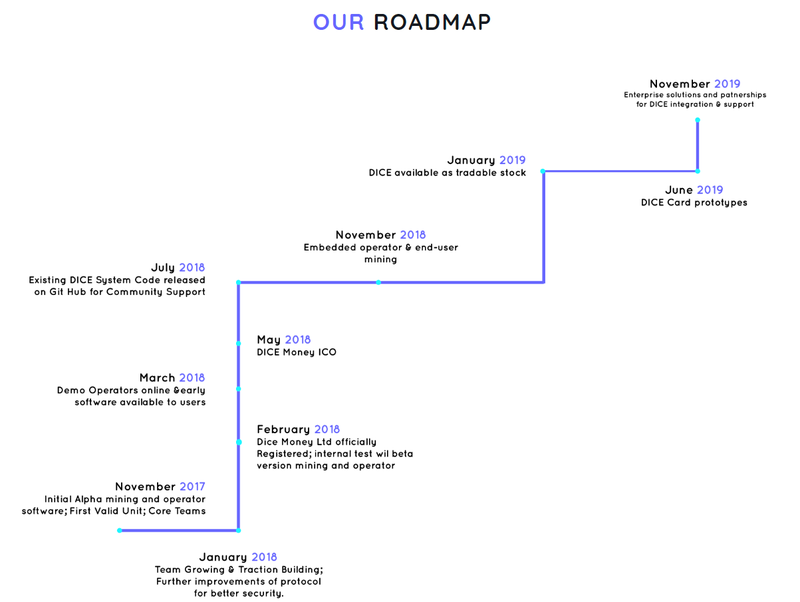 We invite you to read through this document which outlines the DICE model, covers of the ecosystem participants, and our business plans for the ICO and launch of the network.